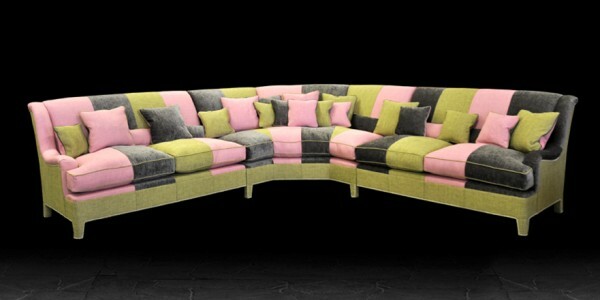 As the Artistic Upholstery furniture range is so large we have split it for you. 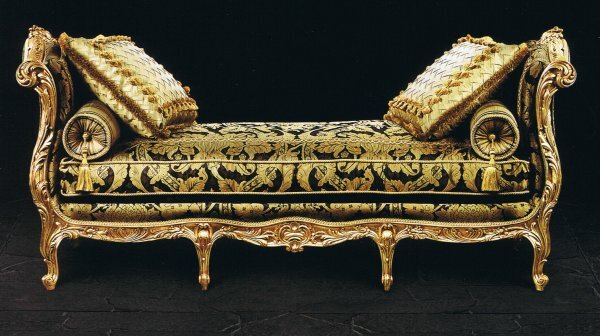 On this page you will find the Artistic Upholstery decorative furniture pieces which are all entirely bespoke and include the best of modern and traditional bespoke English furniture - all of the sofas, armchairs, occasional chairs, sofabeds, daybeds, chaises and footstools are handstitched including any valances and bullion fringes. Of course any of the bespoke sofas, bespoke chairs and other furniture pieces can also be made in the customer's own materials e.g. Sanderson, Osborne and Little, Nina Campbell, Liberty etc. 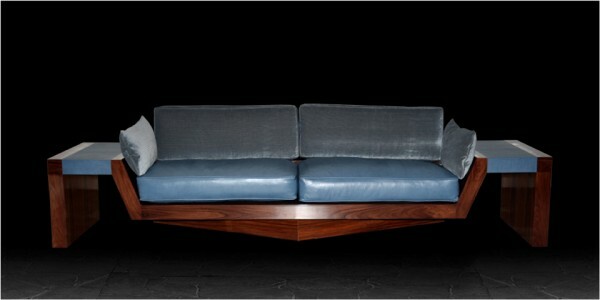 in fact any proprietary fabric - you can either supply your own fabric or Artistic Upholstery will source it for you. You can also order a special commission where you determine the frame design, size, decorative features and you also supply your own fabric. We have included a few examples further below to inspire you. If you are interested in a special commission we can assist you with your choice. At Harvest Moon we can supply all of the Artistic Upholstery bespoke furniture pieces, including the decorative Giovanni sofa as shown above. We have selected a few of our favourite bespoke decorative furniture pieces to show you here as a taster and for Artistic Upholstery's standard collections please click here. 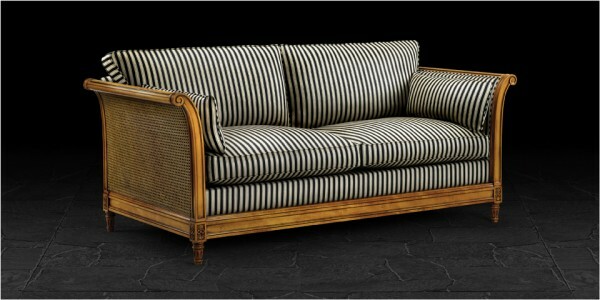 The image below shows the Artistic Upholstery Verona bespoke decorative sofa in Awning Stripe Black / Camel fabric with envelope cushions and bolsters to match. 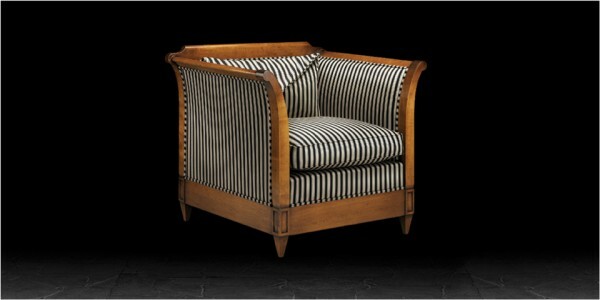 The matching Verona large armchair is shown below, also in the same Awning Stripe Black / Camel fabric. 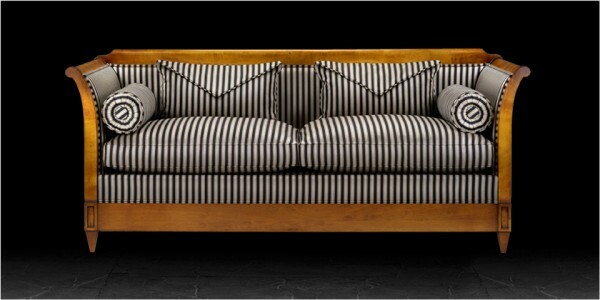 The image below shows the Artistic Upholstery Giovanni bespoke decorative sofa in Awning Stripe Black / Camel fabric with bolsters to match. 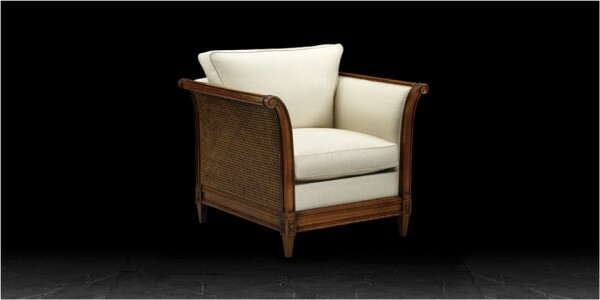 The Giovanni is a classic design with an elegant hardwood frame with lightly scrolled arms, carved and bergere rattan detailing. The image below shows the Artistic Upholstery Giovanni bespoke decorative armchair in Shima Electron fabric. The Artistic Upholstery collection also includes a number of bespoke upholstered day beds including the Artistic Upholstery Bellegio day bed in Rubelli Telemaco fabric with Gold embellishments as shown immediately below. Silver embellishments are also available for the Bellegio day bed. 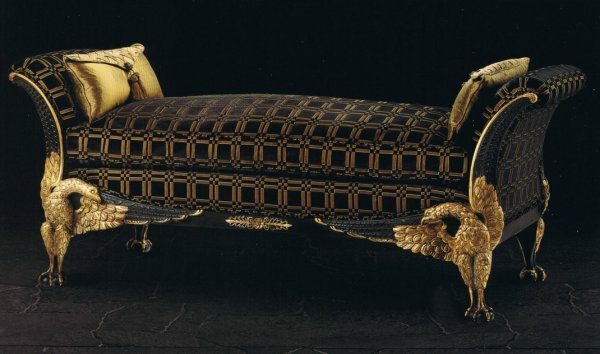 Another day bed example is the Artistic Upholstery Bellini day bed with a gold frame in Beacon Hill Silks with hand made trimmings by Renaissance as shown below. The Bellini day bed is also available with a silver or polished frame. 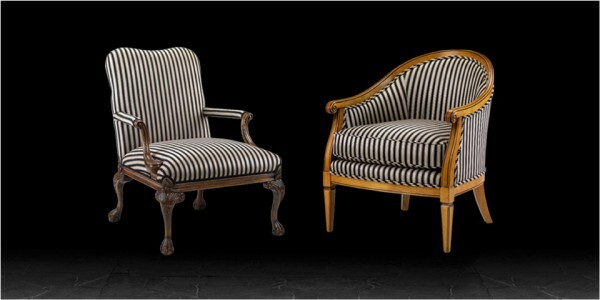 The image below from left to right shows the Artistic Upholstery decorative Lorenzo and Leonardo armchairs in Awning Stripe Black / Camel fabric. The image below shows the Milano decorative armchair in 2 different fabrics and frame colours to show you how different the same chair can look. On the left the Milano armchair can be be seen in Sarang Silk Velvet fabric with a classic dark wood frame including Bergere rattan detail and on the right in Hatfield Cerise fabric and JF1 Antique Finish frame with Bergere rattan detail. 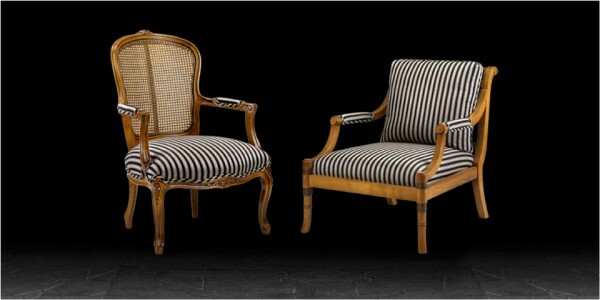 From left to right the image below shows the Artistic Upholstery Sienna and Lucca armchairs wooden framed chairs in Awning Stripe Black / Camel fabric. The Sienna armchair has a tall curved back with Bergere rattan detailing, part upholstered arms and elegant curved legs with carved decorative detail. The Lucca chair has an upholstered back with a scroll that is lower than the Sienna chair, an upholstered seat and part upholstered arms and offers a simpler but beautiful classically understated design. From left to right the image below shows the Artistic Upholstery Venice and Sevilla chairs both of which have beautifully decorated handcrafted frames and the highest quality fabrics. The Sevilla chair is shown here in Premier Praline fabric. The fabric on the Venice chair is no longer available. 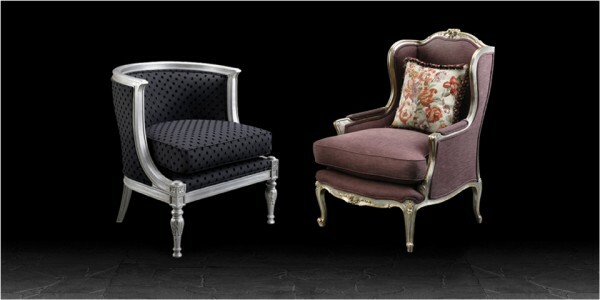 From left to right the image below shows the Artistic Upholstery Daisy and Rosa chairs both in decorative silver leaf frames. 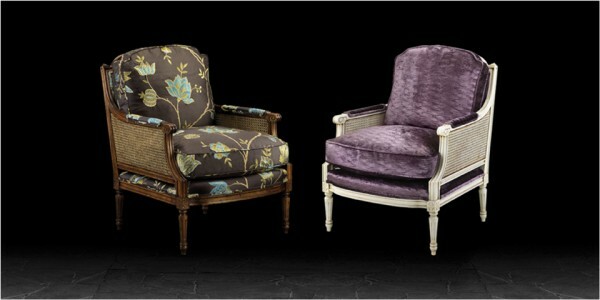 The Daisy chair is shown in a contemporary Tuff Black fabric and the Rosa chair in Purple Velvet. 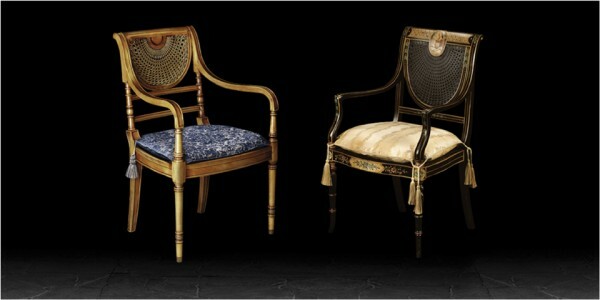 Both chairs are available in a choice of gold or silver leaf or polished frame finish. From left to right the image below shows the Artistic Upholstery decorative Lucia, Sophia and Palatino chairs in classic and contemporary fabrics. The Lucia chair can be seen in a classic Plaid fabric with a polished wood frame, the Sophia chair in Marvic Clover fabric with a gold leaf finish frame and the Palatino chair in Black velvet with a silver leaf frame. 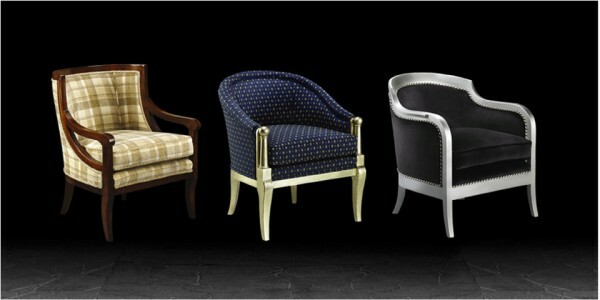 All 3 of these chairs are available in a choice of frames of gold or silver leaf, polished or painted. 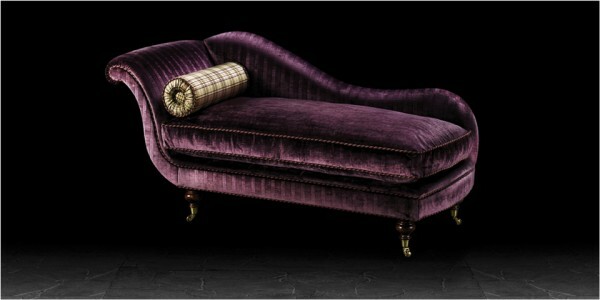 The Artistic Upholstery decorative furniture range also includes several chaise longues including the classically shaped Vienna chaise which can be seen below in Aubergine Velvet fabric with a bolster cushion in Hoyle Plum fabric and with casters. 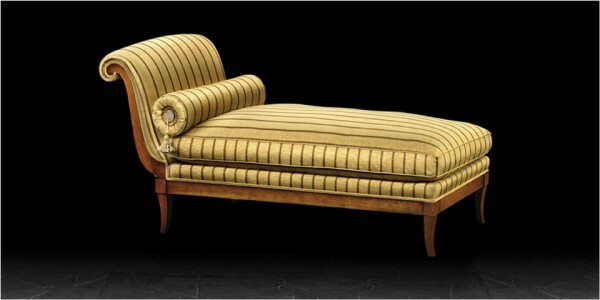 The decorative chaise longues range also includes the Rimini which can be seen below in Polonaise - Black and Gold fabric. As well as offering the option for using your own fabrics on our existing range of furniture Artistic Upholstery also offer the option of special commissions entirely designed and inspired by you. The next few images show some examples of special commissions that Artistic Upholstery have created for customers. Let your imagination run wild and design your own classic, contemporary or retro upholstered furniture from scratch! 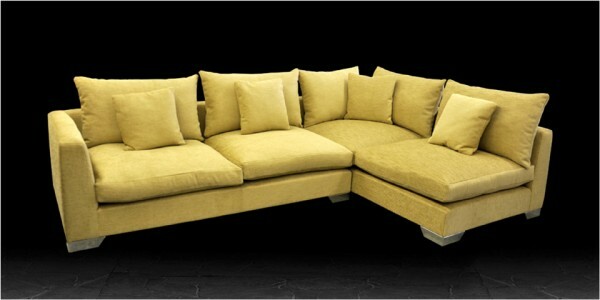 The image above shows a large contemporary corner group sofa upholstered in the customers own fabric and in a custom size. The image below shows another special commission designed by the customer this time with a retro inspired polished wood frame with a small side table at either end and grey-blue leather / velvet fabric. The final example of special commissions undertaken by Artistic Upholstery shows another contemporary corner group sofa also in the customer's own fabric.